On the trailing edge of a late November storm, the mouth of the canyon gaped before me. I wallowed into bib rain pants, jacket, and rubber boots. For reasons I can’t fully explain, I’m compelled to tell the ongoing story of this watery green crease in the Coast Range. 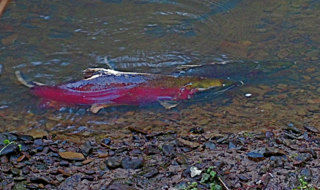 On this showery morning my compulsion was fueled by the possibility that the coho had returned. Yet my compulsion is small and vague compared with coho compulsion, and their thrashing focused impulse to spawn in this thin thread of water sixty river miles from the Pacific. The route into the canyon was familiar. The remains of a logging road made the first half-mile easy walking. The track gave way to a deer trail winding across the foot of a clearcut now healing over with fifteen-year-old Douglas-fir. At the edge of the clearcut, I stepped into the shelter of the old forest and plunged downhill to the creek. Beauty in the canyon bottom is exhausting. Jade trunks of vine maple are contorted into forbidding tangles. Large logs are strewn haphazardly on the ancient forest floor. I teetered across log bridges spanning impenetrable thickets of russet-stemmed Devil’s club and salmonberry. The storm sang in the high boughs, its tone slightly lower and smoother than creek music breaking over sandstone rills. I negotiated the heavy undergrowth and fallen logs to stay near the creek and watch for salmon. There were none. The storm thrashed her way east, leaving a tapering rain in her wake. I found the other old road along the canyon floor and continued in. The old growth ended in a stand of mature second growth marked for cutting with flagging and red spray paint. Despite the rain, the creek remained relatively clear. From the road I could see the blonde gravel riffles and into the bottoms of all but the deepest pools. Still there were no coho. The absence of fish drove me further into the canyon than ever before. The road ended. A phalanx of huge dark trees rose before me, two-hundred-year-old soldiers spared by gaily-colored ribbons labeled “TIMBER CUT BOUNDARY.” Squinting into this old forest that was new to me, I felt a swirling mix of excitement and trepidation. My scratched hands lifted in a silent request to enter. People sometimes ask “How can you know the answer?” The answer is that you don’t know. But knowing is far less important than a willingness to ask. Squinting harder, I lowered my arms and followed a game trail inside. From my left a tiny arteriole of water gurgled downhill. I followed it toward the main channel, struggling over more logs, tree bones slowly returning to the larger life of the canyon. Dimness seeped into my own bones. For a few moments I felt small and alone, as though I was the only human ever to have entered this sanctuary, as though I was the only human left in the world. This far up, the creek was perhaps only four feet across. A gravelly riffle surged from under a large log. When I stepped in, a splash erupted from beneath the log, practically at my feet. A splash, regardless of size, is a disruption in the continuity of water. A signal. I was not alone. Stepping to the other side of the channel, I sat motionless in a soft bed of moss and three-petaled oxalis. A turbid pool gathered just upstream from the log and telltale splash. I stared. Listened. Creek song. Wind song. Rise and fall of my breath, my own stream, lifeline of oxygen, gift from the trees. Yes. Just there. A ghostly undulating tail steadying the yard-long body of a beat up coho, barely visible in the gentle cloudy current. Stared some more. There. Another battered tail, this one smaller, waving slightly faster, holding a second fish next to the first. There then. A mated pair of coho, ready for spawning. I felt a shudder of relief and gratitude and creeping exhaustion in my shoulders. Then I slipped away, back into giant conifers and mossy logs, the living and the life-giving dead. Incessant splashing reached me from just upstream. Another fish. I circled above the plunging sound, well away from the creek, stepped back across the stream, and approached from the other side. A single hen with bony battered fins rested in the small easy water of a pool. She turned on her side and surged into a riffle. Her body became a flesh-and-skin rug beater, pounding silt from the gravel, readying the redd for glistening orange eggs. For many quiet minutes I watched as she surged and thrashed and rested. No buck was evident. The ambivalence of the lone hen haunted me. Was hers the face of optimism, to throw one’s body sidelong into what is absolutely necessary, even when the outcome is uncertain? Or is optimism only driving, thrashing, intergenerational survival, the rawest form of compulsion? The hen returned to her pool and held tightly against the opposite bank. She knew I was there. Even in her urgency, she was moderated by caution. Just downstream a large Douglas-fir log spanned the narrow flow. From its splintered underside hung a foot-long piece of pink flagging tape. The tape was almost certainly there to mark a spawning red. The stream is also monitored by snorkel surveys for smolt. The data are online. I knew how critical those data are in this wounded world where many coho populations have been depleted to 10% of their numbers of only half a century ago. We live in a new time, when historic heat and drought strand smolts in small streams, when ridges and canyons are scorched by vast clearcuts, then scorched again by herbicides. I understand. We need to know what we have done. But I resented that scrap of dayglow pink hanging just above the surface of my creek, marking my coho, disrupting my illusion that the world still holds secret places for salmon who beat their bodies raw to spawn and for people who throw themselves against soaking brush and fallen logs on a stormy morning. I resented my return from mystical witness to rational observer. The shortened leash of afternoon daylight tugged at me. Resentment gave way to hope, even though the practice of hope requires facing difficult possibilities. I hoped this handful of coho could continue; that the unmated hen would find a buck, and her shiny eggs would stick tightly in the gravel and swell with embryonic wriggling, hatching into a new generation that could dart downstream through shadowy pools of cool clean water to grow fat and nickel bright in a healing ocean. I hoped they would return to this canyon. I hoped for my return. Then I plunged into the brush toward home.